My mother, who is the ULTIMATE creative craft consultant (say that 5 times fast), presented me with an almost identical picture of my photo above off Pinterest. She demanded I make this as a gift for my cousin's baby shower. A little threatened at first, I laughed and explained what Etsy.com is, and that this cute little display is only viral on Pinterest because it's being sold on Etsy for $60. Backfiring, she laughed at me, and said "you're making this". I was shocked at how inexpensive and quick this project was. Everyone raved over it. In the end, the joke was actually on Etsy. Use a round-bottomed item found around the house, such as an upside-down bowl or serving plate, to trace a nice big circle onto your cardboard. 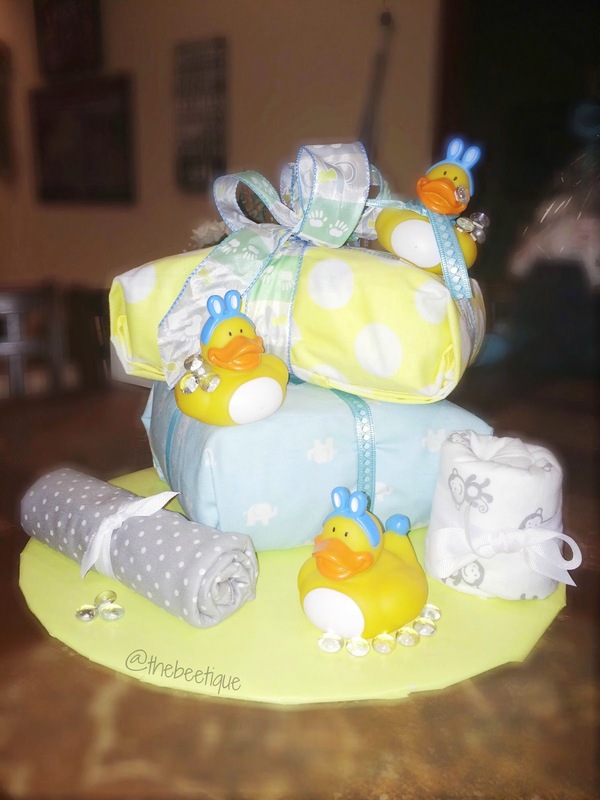 Place diaper packages on top to make sure of appropriate sizing before cutting. Cut when finished. Wrap one side of the cardboard with wrapping paper of choice. This can be a little tricky, hence the jagged edges on mine. It helps to cut your wrapping paper into a circle about 2-3 inches larger than your cardboard circle, then wrap edges in an overlapping-type manner. No body sees the bottom anyway! Use your receiving blankets to wrap the diaper packs. I wrapped them exactly as I would if I were wrapping a gift. Use your double stick tape sparingly to tuck the bottom edges under. Finish it off with ribbon, if necessary. Find an appropriate spot on the cardboard for placement of the bottom diaper pack (I chose the blue one). As a perfectionist, the foundation is always the hardest part! Use your double stick tape to secure in place. A little goes a long way, so I only used 1 inch of tape on each bottom corner. Repeat step 4 with the second diaper pack (I chose the yellow one), and place on top of the first pack. How easy was that? Go crazy with the rest of your receiving blankets and optional decorations by taking advantage of the double stick mounting tape. I rolled up 2 blankets, added 3 dollar store rubber duckies and clear stone "bubbles", then finished it off with a big bow on top. Wrap it with clear wrap to blow all the other gift baskets away, or just leave as is. Who needs to spend $60 + shipping on Etsy when you can spend under $30 + an hour of your day? Not me, and certainly not you.